On August 29, 1959, in a light drizzle, twelve or thirteen Puerto Rican gang members of the Vampires, Crowns and Heart Kings piled into a taxi on their way to a small park in Hell’s Kitchen, Manhattan, a predominantly “white” neighbourhood, to avenge the beating of one of their friends. Armed with an eight inch dagger, a three-foot garrison belt and a sharpened umbrella, the boys were ready for a fight. When arriving at the park, the boys, one of them dressed in a cape, blocked off the exits, trapping some teenagers inside. After some discussion with the kids in the park, someone punched one of the “American” kids. A fight broke out, and before long the cape-clad attacker, Salvador Agron, had stabbed Robert Young and Anthony Krzesinski. Agron also stabbed Ewald Reimer, who then broke free only to be tripped and stomped. Finally somebody said, “He has had enough.” Reimer survived but Young and Krzesinski died shortly after the stabbings. With these two stabbings being the third and fourth gang killings in a week, it threw New York City into an uproar. The press excoriated Agron who did not help matters any when he was quoted as saying, “I don’t care if I burn; my mother can watch.” Read more about the notoriety of the case here. Seven youths in total were charged with the slayings. The Assistant District Attorney, Emanuel Growman, took the statements of the boys. Click here for the summary of the seven boys’ statements. 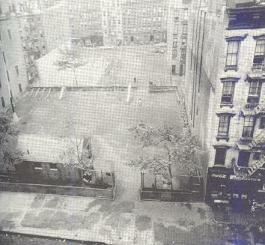 This is the park where the murders took place. The following is a superb description of the park taken from Eric C. Schneider’s work Vampires, Dragons and Egyptian Kings. What happened to the Capeman? Eventually with the help of Eleanor Roosevelt, the death sentence was overturned, six days before the execution was to take place. Agron became very involved in prison, taking courses, becoming active in prison programs and went to college. Finally Agron was released from prison in 1979 only to die in a Bronx hospital seven years later. 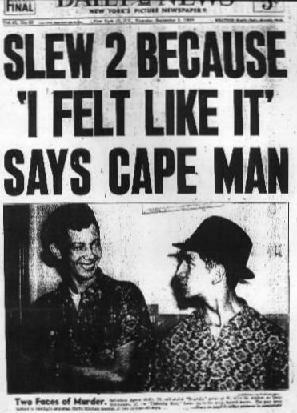 To understand the implications of The Capeman murders, Paul Simon, a New Yorker himself, made a musical on the Capeman that opened on Broadway on January 29, 1998. For a fascinating postcript on the Capeman case, read this 1997 New York Magazine article which is an excellent read. It has references to the other kids in the park who were injured but not killed and what happened to them. See more information on where Sal lived in Brooklyn. Click on this link. Before we leave with our thoughts on the Capeman, I would like to give the last word to the victims. Too often the victims of crime are forgotten and lost in the shuffle. The anguish of the victims’ families must never be forgotten. Nor should the memories of young Anthony Krzesinski and Robert Young, whose lives were cut short with the flash of a blade.